Why does Shakespeare subject Othello to such an immeasurable volume of pain? That soldiers are born to die whether in war or at home is what Shakespeare’s ‘Othello’ seems to be trying to prove. Nothing can be worse for a military general than being made an object of sympathy and being called a weakling and a cuckold. Shakespeare subjects Othello to a kind of pain that is the worst nightmare of any soldier. The volume of pain keeps rising and rising and the hero, who never lost a battle, fails badly at his home front. Why does he subject the general to such a fate? Where does Othello trip? Othello is not a criminal. He is an honest soldier. Then why is he rewarded with pain and death. Is Shakespeare playing with his characters and making them do queer things against their desire like God does with his men? “As flies to wanton guys are we to the Gods!” (King Lear). Othello keeps making mistakes and lets someone else pull the strings in his personal life. Othello is a proud servant of the state of Venice. He has fought for it and proved himself loyal to his duty. However, the reward of being a courageous and loyal soldier is so painful. Has Othello become blind and cannot see Desdemona’ innocence? A general who is an expert at combat strategy cannot see a lie from a truth and believes everything Iago says. A part of him tries to fight but loses its hold fast. He is used to commanding obedience and loyalty and even the thought of being betrayed leaves him deeply unsettled. Family matters are of course sensitive but has the war made Othello blind to the poor woman’s love and loyalty. War changes many things inside a man and perhaps Shakespeare too intends to prove just this. Winning a war is not always equal to winning peace. If you can kill that does not make you a man. Love tests you more than anything else. It is not just Desdemona’s fidelity but the strength of Othello’s love too being tested. Othello is a husband and he is a bit immature to understand and properly deal with his personal relationships. Desdemona is a wife and not a slave. She is a partner and to build a strong partnership, you must treat your partner as an equal. 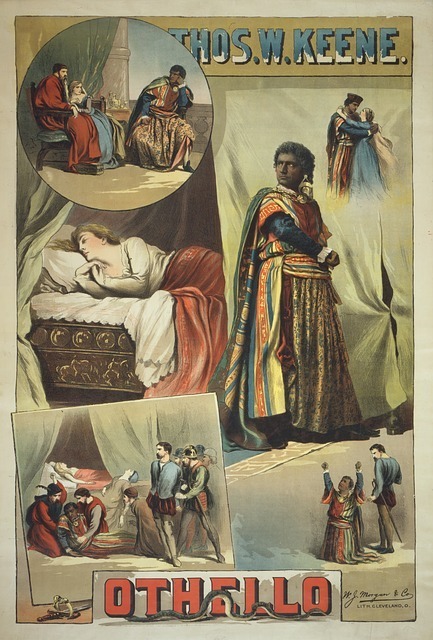 Othello places her at the wrong end – the receiving end, and ends up being there. A balance in family relationships keeps them strong. Emilia speaks appropriately of Venetian men and their poor treatment of the women; if they do not stop treating their women as mere toys, they will lose their honor. Othello too loses his, because his wife is not an equal – a lesser being. If he could only handle his relationship with Desdemona with some more confidence and honor, his fate would have been happier. This is the ugly truth that Shakespeare has brought to the fore in his drama. The kind of pain he has subjected Othello to is a lot like making someone sit on a spear. Shakespeare’s work is full of practical lessons and if you do not want your fate to be as tragic as Othello, you must respect your relationships and your women. Handle them with care because relationships can be brittle. Iago is a rattle snake and his bite makes hearts bleed because he kills not people but relationships. So, Shakespeare proves again that for the want of a nail a war can be lost. There is nothing worse than being a loser in your personal life. Othello has created a hell for himself. He knew using the sword but never knew how it felt being on its receiving end. However, a tongue’s bite can be worse than that of the sword and then the venom Iago has poured into his ears has numbed his mind. Having grown blind to her love and loyalty, Desdemona’s beauty seems a punishment to him. This is the pain a cuckold feels in his heart – useless, trashed, on the brink of hell and a lot more. Desdemona’s love could have been a cure but Othello has become blind and can see only what Iago wants him to. Such a poor end for a highly ranked and influential general! Why ‘Othello’ takes us to the peak of pain if not to teach us a lesson that the hands that handle the sword are not as strong as the hands that nurture relationships? The love in Othello’s life dies the moment the respect for his woman dies in his heart. Desdemona has been trying her best to make her family a garden of bliss but she cannot change the social norms and nor Othello’s perspective. Othello is not much different from the men in his society who know nothing of their women’s emotions. They are gullible and quick to suspect their wives. Iago exploits this weakness and leads the lovers to a horrible death. Had Othello relied on his woman instead of a man (Iago), his fate would have been different. All the while Iago is having a loud laugh behind everyone’s back. Shakespeare has knit the entire drama to teach a simple lesson which is about the value of trust and the importance of personal relationships. The brave general forgot to wear his shield at home and got stabbed in the back – a poor death for a military officer. When you are in so many eyes, the risks are always greater. Othello made the mistake to ignore his risks and ended up in a poor state. It is easier to commit suicide than to worship your woman – a woman who has loved you more than her life. The crime Othello committed was unpardonable and not even Gods could have saved him from his sad fate. Iago has made Othello go through the real test of his life. By the time Othello gets to know, it has been too late. There is no end to his pain and only he could have saved himself for it was his test and no one’s else. It is not in Desdemona’s hands to save her husband from the pain of ignominy growing inside him. He is courageous and confident, but the tide of hatred rising inside him is too difficult to control. Iago makes Othello believe he is an ugly suckling and no match for Desdemona. He has poured lead into the man’s ears and the way it has influenced his psychology is not an anomaly in a male dominated society. Men will be men and for them to be any different would never be possible. Shakespeare so artistically brings us before situations where we see Othello being tested of his patience and mental strength. By striking him on his weakest nerve, Iago has already half killed him. If this pain is ever going to stop, it is when he dies and so he does. Othello’s story is soaked in pain and the Moor keeps bearing the punishment for having made his family and personal life a war.